William H. Beard was born in Painesville, Ohio on April 13, 1824. He studied with his older brother, James Henry Beard, as a portrait painter, but was always interested in subjects found in nature. He painted portraits, animals, and landscapes before gaining a national reputation as a painter of satirical subjects of animals acting like humans. He began his career as a portrait painter in New York City before joining Hudson River artists Albert Bierstadt, Sanford Gifford, and Worthington Whittredge for two years in Europe. When he returned to America in 1858, he opened a studio in Buffalo, New York where he met his future wife, Caroline, the daughter of prominent portrait and genre artist, Thomas LeClaire (1818-1882). LeClaire had studied with Henry Inman (1801-1846), one of the artists who painted Native American portraits that were published as prints by McKenney & Hall. William Holbrook Beard married Caroline Rebecca LeClaire on July 7, 1863. They had two children, a daughter who died in childhood in 1865 and a son Wolcott (Will) born in 1867. Wolcott served in World War I and is buried in Arlington National Cemetery. Although the 1900 Federal Census listed Wolcott as a civil engineer, he was living in an apartment house in Manhattan, New York with Albin J. Conant, Herman Fucchsell, Otto Jaspin, Samuel La Farge, Thomas Wood, Jinquil Yamagishi, and George Yewell, all listed as portrait painters. In 1866, Beard traveled by stage coach through Kansas to Denver, Colorado with the noted travel writer Bayard Taylor. It was Beard’s intent to study the mountain landscape and create sketches for future paintings back in his New York studio. Even though he journeyed 400 miles by horseback in the mountains, he was not impressed with the western landscape and returned by stage coach through Nebraska via the South Platte and Platte River route to Lone Tree (present-day Central City, Nebraska) where he was able to connect with a train returning to Omaha. Bayard Taylor’s 185-page book of letters, Colorado: A Summer Trip, was originally printed in the New York Tribune. Taylor describes Beard’s activities in 16 different pages scattered throughout the book. Some of his accounts describe Beard sketching an eagle’s nest; Beard’s statement that he wished his friend Sanford Gifford could see the landscape; and their meeting on the South Platte with Henry Arthur Elkins, Henry Chapman Ford, and James F. Gookins, all Chicago artists. The Beard/Taylor party also knew Worthington Whittredge was at Pike’s Peak. Taylor commented several times that Beard physically struggled on the journey and did little sketching in Colorado. Taylor’s letters frequently attack the false notion that this area was the “Great American Desert” as described by Major Stephen Long in 1819, but Beard found the area monotonous and had little to interest him. 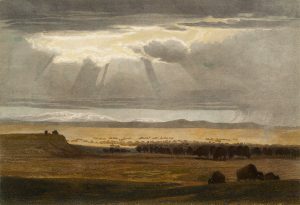 The Smithsonian Inventory of American Paintings lists 127 paintings created by Beard and only a few of them seem to be related to this 1866 journey through Kansas, Colorado, and Nebraska: Indians on the plains, prairie chickens, a fox and a wildcat, deer and antelope paintings, and a grizzly in a western landscape. The Museum of Nebraska Art (MONA) has two significant Beard works associated with this 1866 journey, an 8½ x 12½” steel engraving titled On the Prairie and a 24 x 18” oil painting, Deer on the Prairie. MONA also has an excellent self portrait by the artist, a 20 x 24” oil painting. Beard spent most of the last 40 years of his career working in his studio located on 10th Street between 5th and 6th Avenues in New York City in The Studio Building, a renowned structure for artists built in 1857. In 1897, a reporter with The New York Times interviewed Beard and listed the artists Beard knew who had studios there in the past and then: Albert Bierstadt, J.G. Brown, William Merritt Chase, Frederick Church, Lockwood de Forest, William De Haas, Sanford Gifford, Winslow Homer, Emanuel Leutze, William Page, T. B. Reid, James Suydam, Hendrik-Kirk Kruseman Van Elten, Horatio Walker, Worthington Whittredge, and Thomas W. Wood. Beard was quoted that he had been working in this studio for over 36 years, further saying that Whittredge was there before him and still had a studio there. Beard’s works are found in the collections of New York City’s Brooklyn Museum, Metropolitan Museum of Art, and New York Historical Society; Museum of Fine Arts, Boston, and Harvard University Art Museums, Cambridge Massachusetts; Smithsonian American Art Museum, Washington, D.C.; Indianapolis Museum of Art, Indiana; Joslyn Art Museum, Omaha, Nebraska; National Museum of Wildlife Art, Jackson, Wyoming; and Utah Museum of Fine Arts, Salt Lake City. Although Beard was an excellent portrait and landscape painter, his major income derived from his paintings of allegorical and fantasy subjects, especially bears. As a member of the National Academy of Design, he exhibited those works there. It is also important to note his association with Albert Bierstadt, Sanford Gifford, and Worthington Whittredge, artists who also visited the Nebraska landscape and were influenced by the prairie. William Beard died in New York City on February 20, 1900. The Museum of Nebraska Art has three works by William Holbrook Beard. Researched and written by Gary Zaruba, 2011, a project of MONA’s Bison Society. Ancestry.com Newspaper Collection: New York Times, August 8, 1897, p. 14. Colorado: A Summer Trip by Bayard Taylor, edited by William W. Savage, Jr. and James H.
Lazalier. 2010 reprint. University Press of Colorado, 1989. Smithsonian Inventory of American Paintings, SIRIS, Smithsonian American Art Museum, Washington, D.C., online.